*The combined 7-vaccine series (4:3:1:3*:3:1:4) includes ≥4 doses of DTaP, ≥3 doses of Polio, ≥1 dose of measles-containing vaccine, Hib full series, ≥3 HepB, ≥1 Var, and ≥4 PCV. * - At risk individuals: Individuals who have self-reported having one or more of the following: 1 )having current asthma; 2)ever being told by a health professional they have diabetes, myocardial infarction, angina or coronary heart disease; 3) being a current smoker; or 4) ever being told by a health professional they have chronic obstructive pulmonary disease, emphysema or chronic bronchitis, or cancer (excluding skin cancer). 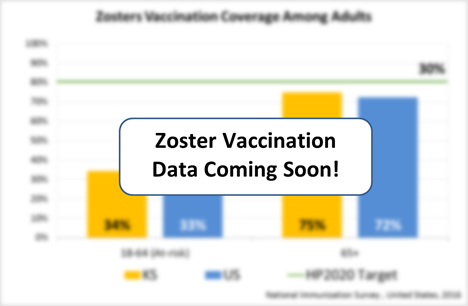 NOTE: There is currently no state or national data for the Zosters (Shingles) vaccine. The Kansas Department of Health and Environment conducts Immunization Coverage Assessments into the statewide vaccination records of various age groups across the state. The reports aim to provide an understanding of the vaccination coverages in the state and how they compare to the recommendations by the Advisory Committee for Immunization Practices (ACIP) and the American College Health Association (ACHA). A primary benefit to these reports is the ability to see vaccination coverage at a local level (e.g. by county), which is not possible through national resources. Click on the links below to view a highlight of the respective report's data, and a link report itself. The Kindergarten Immunization Coverage Survey is a collection of vaccination records for children enrolled in a kindergarten class at Kansas public and private schools during the school year (current report is for the 2016-2017 year). Statewide vaccination coverage levels are calculated and various factors assessed. This study includes children between the ages of five and seven. 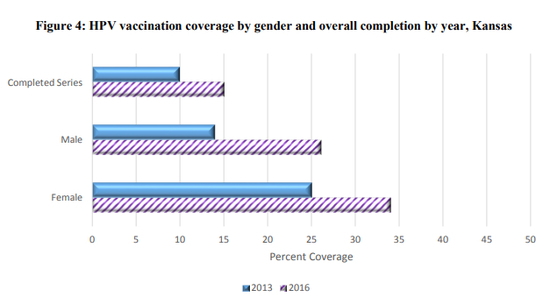 This report provides the statewide vaccination coverage of kindergarten students at school entry (Seen below in Figure 1). This report also provides visuals for each vaccine, displaying the respective rate of unvaccinated kindergarten students by county (Seen below in Appendix 2). This report also included the reporting of vaccination exemption rates for medical and religious purposes. The map of this data can be seen below in Figure 7. The Retrospective Immunization Coverage Survey is an assessment conducted annually to assess the vaccination coverage among current kindergarten students when they were 24 and 35 months of age. The population for this study includes current kindergarten students between the ages of five and seven on the first day of the academic year enrolled in either a public or private school in Kansas. This report provides insight into the statewide vaccination coverage of kindergarten students at the age of 24 and 35 months (Seen below in Figure 1). This report also provides the statewide vaccination coverage of kindergarten students at the age of 24 and 35 months by county type (Seen below in Figure 3). This report also provides a data table containing the vaccination rate of kindergarten students at the age of 35 months by type (Seen below in Appendix 2). The Childhood Influenza Vaccination Coverage in Kansas report is an analysis of the Behavioral Risk Factor Survaillance System (BRFSS) telephone surveys being done in the state of Kansas, and nationally in the US. This report focuses on BRFSS data collected from 2015-2016 for the state of Kansas, and analyzes the influenza vaccination coverage of children (ages 6 months - 17 years). This report also addresses the limitations, as well as the strengths of the BRFSS survey. The Adolescent Vaccination Coverage in Kansas report is an analysis of the Behavioral Risk Factor Survaillance System (BRFSS) telephone surveys being done in the state of Kansas, and nationally in the US. This report focuses on BRFSS data collected from 2011-2016 for the state of Kansas, and analyzes the vaccination coverage of adolescents (ages 10 - 17). This report also addresses the limitations, as well as the strengths of the BRFSS survey. This report provides insight into the statewide vaccination coverage of adolescents by year (Seen below in Figure 1). This report also provides visual representation of the change in vaccination coverage of adolescents by year for Tdap, MenACWY, and HPV (HPV is seen below in Figure 4). The Assessment of Immunization Policies of Four-Year Colleges and Universities in Kansas consisted of a survey that was developed and administered to all four-year colleges and universities, both public and private, to understand the institution's immunization policy. The purpose of this study was to determine the current vaccine-preventable disease immunization requirement of four-year colleges and universities in the state.